A couple of years ago I read a lovely book with my daughters that was called ‘Ruby Flew Too’. 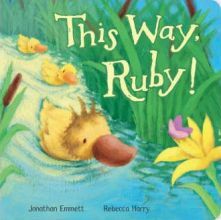 It was written by Jonathan Emmett and illustrated by Rebecca Harry and we thoroughly enjoyed this lovely tale of a little duck called Ruby who was the last to hatch and slow to catch on to all the things that her brothers and sisters could do. She did however always manage them – but in her own time! The reason why I am telling you all this is because on a recent visit to the library, my girls were very excited when they discovered another book about this lovely character – ‘This Way Ruby!’ Of course we had to borrow it and I don’t think that my daughters will want to take it back! Unfortunately a storm blows up and the fearless ducklings are suddenly not so brave especially when they realise that they are lost. Luckily, Ruby catches them up and realises that she can help them all find their way home. She spots the willow tree and heads towards that shouting ‘This way’ as she goes. She then traces the way back to their parents by remembering all of the landmarks that she stopped to notice on the way. Everyone is very relieved and they recognise that Ruby taking it a bit more slowly can sometimes be a good thing! I think this is beautifully described with some good examples of alliteration too. There are many other parts that I could have quoted which would have been just as good too. ‘This Way Ruby‘ is an ideal book for young children and will probably appeal to quite a wide age range. With not too many words on any page it will be ideal for children who are just starting off as independent readers and it has lots of repetitive phrases for children who are not quite at that stage to join in with. The font is bold and appealing and sometimes the sentences are positioned in interesting ways on the page, often ebbing and flowing like the river current. This makes it interesting for young readers. The illustrations are beautiful too. They are pretty much in muted pastel colours that create a whimsical feel with lots of pale blue, green and yellow. They really do make the book look quite charming. It’s lovely to meet characters that we have met before (especially as they are so cute) but it is not necessary to have read ‘Ruby Flew Too!’ in order to enjoy this one. I’m not sure whether there are any more books about Ruby’s adventures but it would be great if there were and I know that my daughters will definitely be on the look out for them! No Comments on "This Way Ruby"